People want to learn how to make Irish appetizer recipes and other foods especially for New Years Eve celebrations. Many Irish traditions and Irish superstitions are also relived each year; more so than most other countries. Houses are cleaned spotless and doors are left unlocked on New Years Eve, waiting for the arrival of their guests; guests that have passed on. The Irish have a custom of banging on the doors and windows with Christmas cakes or breads. This is supposed to chase the bad spirits away and let the good luck in. Young women sleep with mistletoe under their pillows to find a man. There are many such ideas that have been passed down through the years but like in all countries, food and family are at the top of all traditions. There are many potato pancake recipes from many different countries. 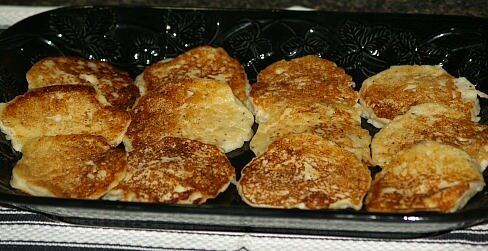 The Irish have a variety of different versions of “boxty recipes” traditional Irish dishes made of potatoes. This potato pancake usually consists of a combination of freshly grated potatoes and mashed potatoes. They make great appetizers for a New Years Eve party or as a side dish to your meal. Peel and cut up 3 potatoes; cover with water and cook until tender. While potatoes are cooking, peel 3 potatoes and grate; rinse and squeeze excess water out. When potatoes are tender, drain all the water off and place in a mixing bowl. Beat the potatoes until smooth adding a little of the buttermilk. Beat in the eggs, grated potatoes, salt and pepper. Add the flour mixture and as much of the buttermilk to make pouring consistency (like pancake batter). Heat griddle with oil; add ¼ cup of batter to hot griddle to make pancakes. Cook on both sides and serve hot. 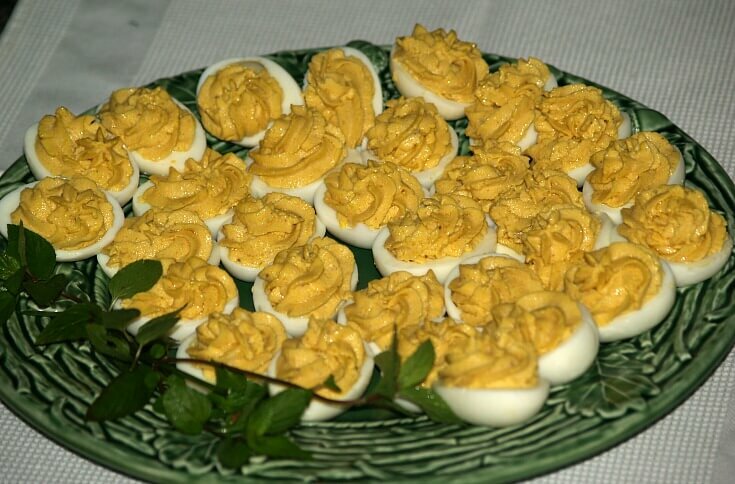 People who make a lot of Irish appetizer recipes almost always make Irish deviled eggs. They are cheap, easy and everyone loves them. Peel eggs and cut in half; remove yolks and place in food processor. Add the garlic, anchovies, lemon juice, mayonnaise and mustard. Process mixture until smooth and creamy. Add 6 of the white egg halves to the mixture. Process mixture until whites are well blended into mixture. Use a pastry bag with a large tip to fill the remaining white halves. Like potatoes, another popular and abundant vegetable to cook with in Ireland is the turnip. They are cheap to purchase and many different types of turnip recipes can be prepared from them. When you learn how to make Irish appetizer recipes, you will also find these included in these recipes. In a large saucepan, combine the bouillon cubes and water; heat until water boils and cubes dissolve. Add turnips; simmer uncovered about 30 minutes or until tender. In a saucepan melt the butter and add the onions; cook until tender. Place drained turnips in a large mixing bowl and start mixing. Add the butter and onion and mix; and the parsley and sugar. Serve with small slices of toasted Irish soda bread. When Irish appetizer recipes combine two of the most favorite ingredients, corn beef and cabbage, they will surely be a hit. Spray miniature muffin tins with non stick spray; brush one side of wonton skins with melted butter. Carefully press wonton skins butter side up in muffin cups. Combine and blend in a medium bowl the cheeses, corn beef, cabbage, onion and thyme. Spoon mixture into wonton lined muffin cups; bake 15 to 20 minutes or until wonton skins are golden brown. Combine and blend cream cheese, onion and mustard. Spread mixture on slice of corn beef and roll up “jelly roll” style. Repeat until all corn beef is used; wrap and refrigerate for 24 hours before serving. As you are learning how to make Irish appetizer recipes you will find this sausage recipe to be very popular. Combine and blend ground pork, garlic, thyme, rosemary, marjoram, breadcrumbs and beaten egg. Shape into small sausage links size (about 1 ½ inches long). Wrap sausages in pieces puff pastry; bake about 15 minutes or until sausages are done and pastry is golden brown. Learn how to make Irish appetizer recipes like these beer battered sausages. TO MAKE BATTER sift 1 ¾ cups flour and the corn flour into a bowl. Add mustard and beer stirring until well blended and smooth. TO FRY SAUSAGES dust with a light coating of flour; heat oil in heavy pan or fryer. Dip sausages in batter and drop in hot oil without crowding. Deep fry about 5 minutes or until golden brown; drain on paper towels. TO MAKE SAUCE combine and blend mayonnaise, mustard and lime juice in bowl. Add salt and pepper; mix well. TO SERVE SAUSAGES insert picks into sausages; arrange on lettuce covered plate. Serve with sauce; serves 4 to 6. Learn how to make Irish appetizers like these crab rolls. Mix together egg yolk and water; set aside. Combine mayonnaise and mustard in a bowl; add flaked crab. Add herbs and watercress to the bowl; blend well and season to taste. Place a spring roll wrapper on workspace with corner pointed toward you. Brush around edges of wrapper with the egg yolk mixture. Spoon ¼ of the crab mixture in a line across one corner. Fold the wrapper over the filling and fold in the side corners. Continue rolling the wrapper to a nice cylinder. Place on parchment lined tray; continue rolling remaining three. Lightly brush rolls with egg wash; refrigerate for 30 minutes. Pour oil into a deep pan bout 2 ½ inches deep; heat to 350F degrees. Deep fry spring rolls until crisp and golden brown about 3 to 4 minutes. Drain on paper towels; to serve cut in half and place on plate. Garnish with watercress; drizzle chili jam over top. Place chilies, sugar and vinegar in saucepan. Bring to a boil over medium heat stirring until sugar is dissolved. Reduce heat and simmer about 10 minutes until mixture is reduced by half.